Our next Featured Tattooed Mom is Megan S. Megan is from Lakewood, OH, a nice little suburb of Cleveland – that just happens to also be where I grew up! She’s a big Disney fan and a loving mom. Get to know more about her by reading her interview below! I have a 9 year old daughter. Her name is Emily. They haven’t said anything to me or her. I am a mixture of strict and laid back. I make sure she listens to the rules. She must have respect for people, our pets and her toys. I explain to her why it is important for her to follow the rules and I don’t say “because I said so”. I like to make sure she knows why she is doing something and she understands. It is important to me that she is well mannered and respectful. On the other hand, I give her freedom to do the things she wants to do. I don’t hover over her. I want her to go out and experience the world and I try to encourage her to pursue things that interest her. I didn’t realize that how I act and the things I say to Emily affects her so deeply. I have learned to think about what I want to say so she can still have confidence and not make her feel bad about herself. She deals with anxiety and ADHD so she is more sensitive to how people act and what they say. The other thing I learned was how much she watches me and does the things I do. It is hard because I am lazy and wait until the last minute type of person and I don’t like those things about myself. And now, she is starting to be like me! Being a mom has made me reevaluate myself and how to be a better version of myself. I have not been discriminated. A lot of the moms in my circle of friends or the moms I see at my daughter’s school have tattoos. I have 12 tattoos. Most of them can be hidden. I got most of them prior to tattoos in the work place being acceptable. My first tattoo was Gumby and I got him when I was 18. I always said when I turn 18 I was going to get a Gumby tattoo. I got him done at G & G Tattoo in Willoughby. My next tattoo was a yin yang. Where the white part of the yin yang is a rainbow. I also had that tattoo done at G & G Tattoo. The next tattoo is a heart with a vine of each side of the heart. I don’t remember where I got the tattoo; I went with a friend and it was his favorite place to go. Next, I got the typical tramp stamp. It is a butterfly. A group of friends went and got tattoos. We went to Art in Motion in Medina. Which ended up being my favorite place to get tattoos. The next 4 tattoos are spiritual related. I got them all at Art in Motion. They are my zodiac symbol, Leo. Ohm, Triquetra and Buddha eyes. My friend wanted to get a tattoo and she didn’t like where she was going so I took her to Art in Motion to get her tattoo and I got a tattoo of a flower with a squiggle line on each side. I don’t remember when or why, but I got a smiling sun on my wrist. I think it was when I took my mom to get a tattoo. We went to Art in Motion. I was going through a break up and I wanted to do something drastic so I got another tattoo. It is a quarter moon smiling with the other half of the circle blue with stars. I went to Art in Motion. My final and favorite tattoo I got because of my daughter. She drew a multi colored heart in Kindergarten. I always wanted to get a tattoo that was related to my daughter and I chose this art piece because it would make a perfect tattoo. I had it done at Voodoo Monkey on W. 25 in Cleveland. I was 18 and I got Gumby. It isn’t a hobby yet, but I hope one day it will be. I want to be able to travel with my daughter. Right now, we try new activities in the CLE. EPCOT Gray. I am a huge Walt Disney World fan. My favorite park is EPCOT where the “golf ball” is located. Prev post Puff, Puff, Sip. 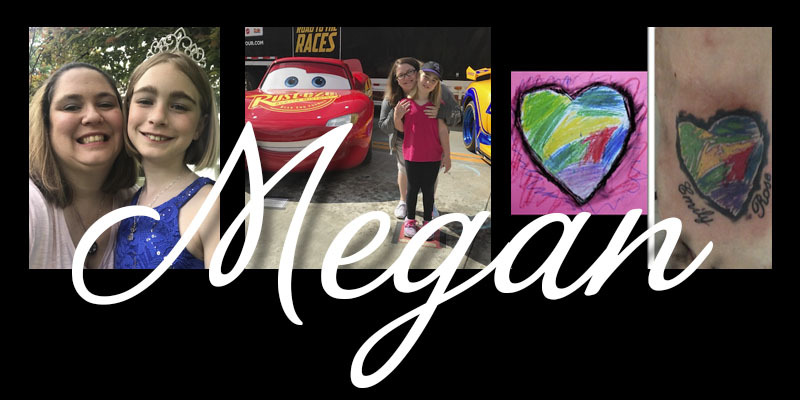 Next post Featured Tattooed Mom: Megan B.